Flash back to 2016, and most of us had never heard of electric bikes. We’d get in our cars, and give little thought to commuting 1-2 miles to work here in hilly Hood River, Oregon. After all, riding to work meant arriving sweaty, stinky and fatigued. Fast forward to the present, and almost all of our staff rides e-bikes to work. We arrive happy, energized, and decidedly not smelly. 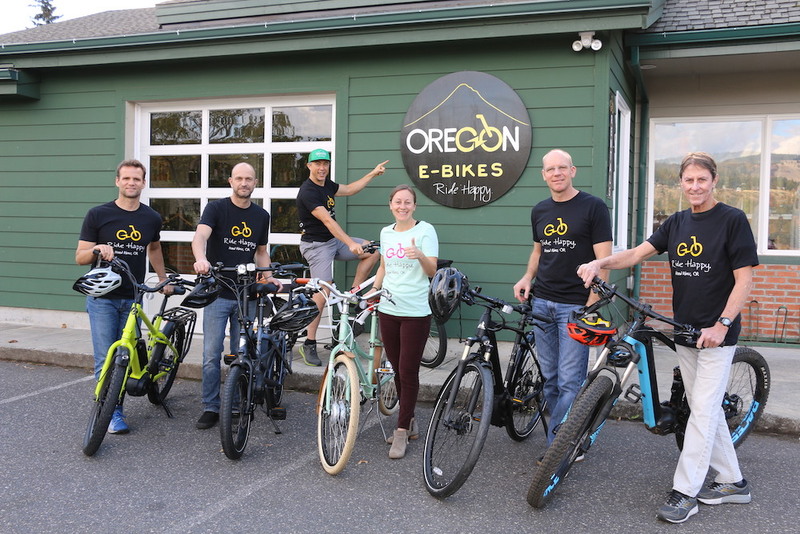 Of course, why we e-bike here at Oregon E-Bikes goes beyond commuting. Some of us are married with children, others live the bachelor life, and a few of us are headed for retirement. Despite our differences, the reasons we e-bike share common ground. Here are our Top 5 reasons to make the e-bike switch. This is THE reason why our shop’s bike rack went from empty to full in a matter of months, and why our ethos is 'Ride Happy'. The first time each of us hopped on a bike and powered up the electric assist, ear-to-ear grins and tears from laughing followed. Trust us, Lily the Pug is having fun too. This was a surprising one for us, as there was anticipation that we’d be sacrificing convenience by riding an e-bike instead of driving a car on a daily basis. What we’ve found, however, is that it seems to be a non-issue. We no longer have to circle the block for a parking spot or go out of our way to find a gas station, and we can also keep up with cars on most of the city streets. All of this, without any extra registration or vehicle classification, and it takes hassle out of your day. The start of the daily commute. While there is a sentiment in some circles that e-biking is ‘cheating’, we’ve actually found it to be a great form of exercise. With the e-assist you can choose how much assistance you want (anywhere from no assistance to ‘turbo’ mode), and the bonus is that you can ride twice the distance in the same amount of time. What used to be a lunchtime ride of 10 miles for Jodie on her road bike can now be a 20 mile ride on her e-bike, and what is typically a 6 mile mountain bike ride after work for Matt has the opportunity to now be a 12 mile ride on his eMTB. 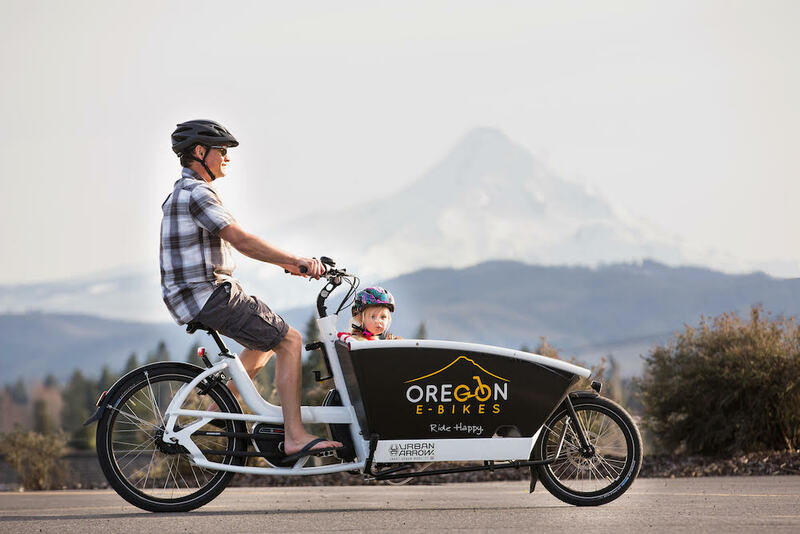 For Steve, riding his e-Fat bike all over town and trails allowed him to continue to get some exercise while undergoing chemotherapy, and for TJ riding his e-Cargo bike to and from work is building more muscle than driving his truck. TJ in muscle-building mode with his daughter Olivia. For all of us cruising around on e-bikes, we’ve been blown away at the conversations it’s started with friends and strangers alike. 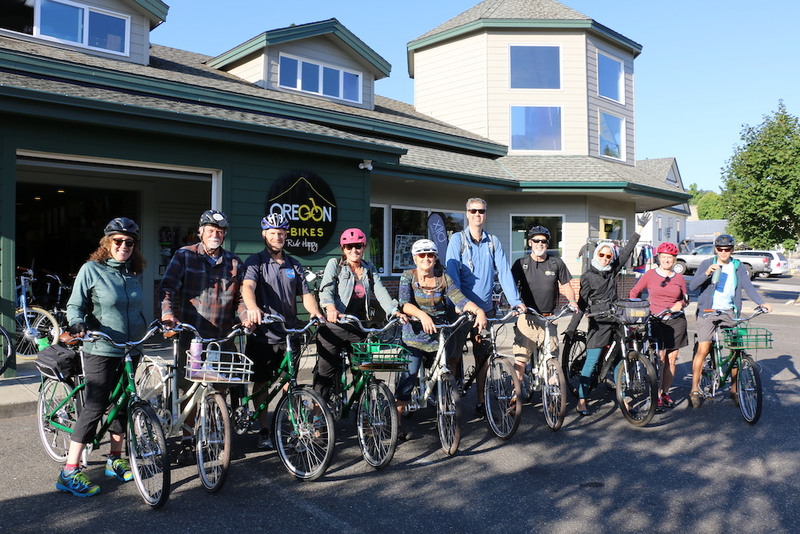 TJ’s e-Cargo quickly became a neighborhood favorite, and it didn’t take long for Steve’s infusion nurse to set her sights on an e-bike after seeing the smiles on Steve’s face when he showed up at the hospital for treatment. One of the countless groups of happy riders at OEB. This is really the over-arching reason why all of us love e-bikes. More fun, convenience, exercise and community – that’s a lot to gain from a bike! With an e-bike we can also get to work, to school, to the grocery store and to the beach with minimal environmental impact, leaving our legacy a little greener. 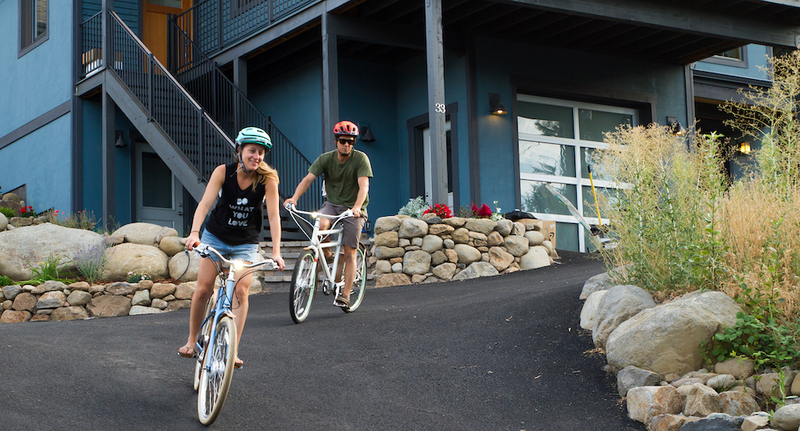 We’ve found that e-bikes have opened our eyes to a lifestyle that creates more smiles, more time outside, more time with family, and a greater sense of community. 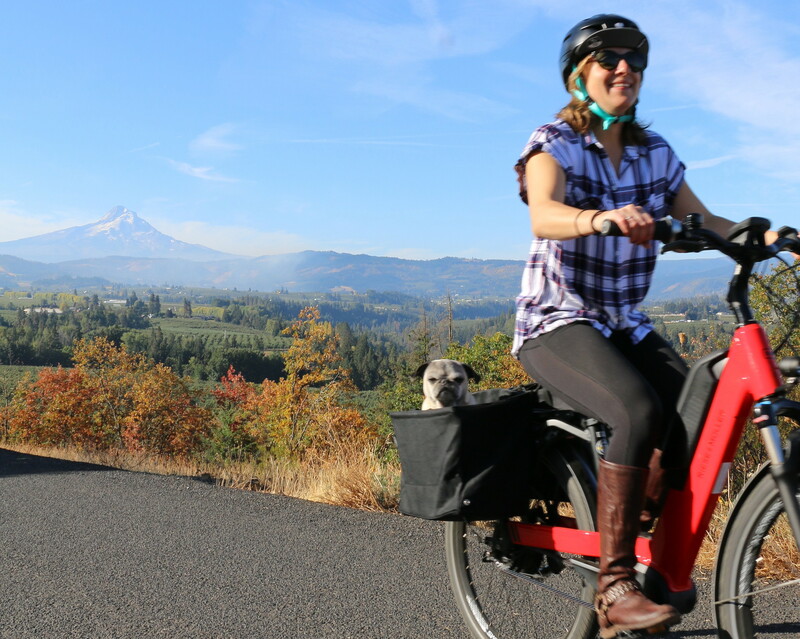 Our motto here at Oregon E-Bikes is ‘Ride Happy’, and we’re living it! Eddy, Ollie, Matt, Jodie, Mark and Steve.